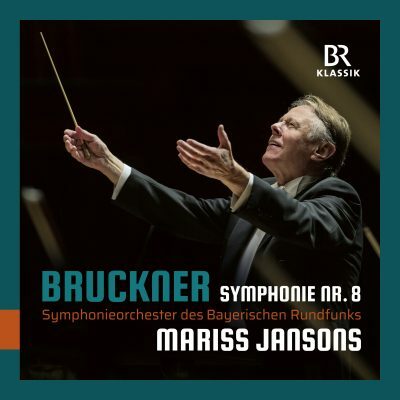 StartseiteHome BRSO Media Center CDs & DVDs Mariss Jansons: Bruckner "Symphony No. 8 C minor"
Mariss Jansons: Bruckner "Symphony No. 8 C minor"
Anton Bruckner wanted to create the greatest instrumental symphony of all time with his monumental 8. Symphony, , including highest demands on the interpreters. Not only did it become a model for Mahler's symphonies, but it is also an integral part of the symphonic repertoire. The recording of the concert in November 2017 at the Philharmonie in Gasteig will now be released on CD, performed by the Bavarian Radio Symphony Orchestra under the direction of Mariss Jansons. The genesis of Anton Bruckner’s Eighth Symphony was probably affected by a bout of sudden fame that boosted the composer’s constantly shaky self-confidence. After the performance of Bruckner’s Seventh, the famous conductor Hermann Levi had hailed him as “the greatest symphonist since the death of Beethoven”. Frequently ridiculed in Vienna, Bruckner had finally been taken seriously in Munich: his importance had been recognized, and the Austrian emperor had awarded him the Order of Franz Joseph – something that filled the composer with very special pride. In the summer of 1884 he set to work on a new symphony, returning this time to C minor, the key of his first two symphonies. This key had an especially powerful symphonic precedent in Beethoven’s Fifth, and virtually challenged him to make the journey per aspera ad astra (“through the night to the light”). He wanted to create the greatest instrumental symphony of all time; its scale became gigantic, placing huge demands on performers and audience alike. The incomparably bold design of the finale probably represents the longest and most daring sonata-form movement ever written; Bruckner referred to it as “the most important movement of my life”. Towards the end of it, when the main themes of all four movements sound simultaneously, he wrote a euphoric “Hallelujah!” into the draft. Since then, Bruckner’s Eighth Symphony has been an integral part of the symphonic repertoire, yet it still continues to present a huge challenge to performers. Mariss Jansons and the musicians of the Symphonieorchester des Bayerischen Rundfunks are however more than equal to the extraordinary demands made by this masterpiece. The recording of the Munich concert event of November 2017 has now been released on CD by BR-KLASSIK: it is an exemplary performance of one of the most important compositions of the Late Romantic symphonic repertoire, in its version of 1890. With Bruckner’s Eighth, Mariss Jansons and the Symphonieorchester des Bayerischen Rundfunks not only delighted their concert audience in Munich but also those in Luxembourg, Brussels, Vienna and Milan during their tour at the end of November 2017.